With five laps remaining in the event, there was a battle at the front of the field. Peyton Sellers, Lee Pulliam and Phillip Morris were nose to tail for the win. Pulliam and Morris made contact. Pulliam left the door open and Morris filled the hole. He took the position with some short track racing contact. Pulliam drove it into turn three and dumped him. Morris was sent into the wall. “When we got up to Turn 3, he just dumped me. I wasn’t expecting it. I thought he had matured more than that. It happens. At least you know what to expect from now on,” Morris continued. The red flag flew. Cleanup was underway as the field parked before turns 1-2. Morris’ crew chief Forrest Reynolds jumped the wall and entered the racing surface. He pointed at Lee Pulliam and tossed his radio into his front windshield. Pulliam began cranking his engine at Reynolds walked around the car. The passenger side lacks a window on these cars. The crew chief jumped into the window. The speculation is that the crew chief was reaching in to pull the ignition wires. If so, that would have made the car un-driveable. Instead, Pulliam drove off under the red flag at a high rate of speed with the crew chief still in the side window. He shook the car and the crew chief fell out onto the race track, inches from the rear tires. “We are here to race, not crash and kill each other. I don’t know. It shocked me more than it did anybody. I was looking at Peyton and trying to take the lead. I didn’t have any idea that he was going to do that. It’s racing. You put it all out there and do the best you can,” Morris said. The incident on the track was followed by heated discussions in the pit area between teams with officials between them. Track officials ejected the crew chief of Reynolds. They also sent Pulliam to the tail of the field, he finished 10th. Philip Morris was the winner in the first main event. Peyton Sellers won the 2nd main event of the twin-75. 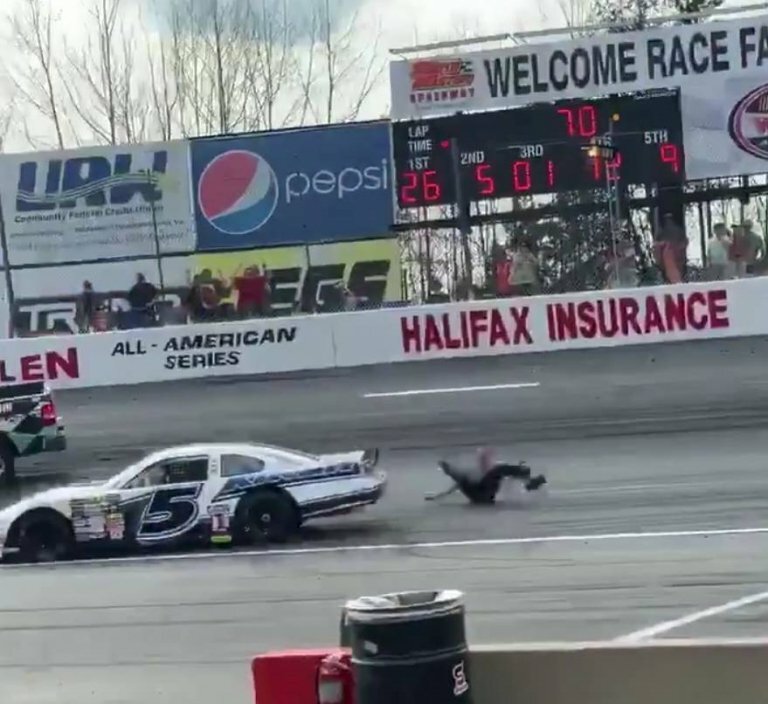 Watch several videos from the South Boston Speedway altercation below.